When creating the perfect home, many people will focus on the interior main floors first, or the areas where they expect most of their guests to see. Once these floors and room are perfected, many will think that their job is done. The perfect home is not only one that looks good at first glance, but also one that completely uses every single available space. This includes making the best use of the basement, and most people find it beneficial to create an extra bedroom in their basement space. Here are seven simple tips for finishing a basement bedroom. The first thing that anyone should to do prep their basement for a remodel is make sure the space can be connected to the rest of the home. This often means wiring the space for internet and TV services. This will create the best start for the perfect basement space. The basement is often the area of the home that is given the least amount of attention when it comes to insulation. To keep the area at the ideal temperature, extra insulation will almost always need to be added. In addition, people with an unfinished basement will need to complete the drywall to create an integral space in the home. When people want to add a bedroom in the basement, they often forget about how living in that space will be on a regular basis. Depending on the layout of the home, it might be beneficial or even necessary to build a basement bathroom to go along with the bedroom. 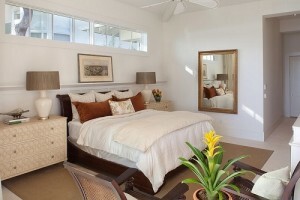 This can help everyone create the ultimate guest suite that everyone will feel comfortable in. Water and humidity in the basement is a couple of issues that many home owners need to deal with. Installing a drainage system is the best defense against flooding, along with creating a system to control humidity with a good dehumidifier. An issue most people have when planning a basement bedroom is lower ceilings. This issue can be troublesome for a couple reasons. Most people will want to make the room bigger to make up for the extra space, and many people will struggle to find the right layout that can accommodate this space without interfering with the rest of the basement’s design. Seek the help of a professional if struggling with these issues. Lighting is essential for any basement space. Because there is so little natural light, people need to be extra creative with lighting options. Try using recessed lighting to save space, along with floor lamp options to complete the look. Once the space is completely finished, décor is the final touch that will make it feel like another part of the home instead of just an addition. Create a fluid look that will welcome anyone into this new space. Be the first to comment on "7 Simple Tips for Finishing a Basement Bedroom"